The base cookie for this recipe, The Chewy Chocolate Cookie, is a recipe that I found while going through my file. As I looked at the left-slanted cursive handwriting on the stained and wrinkled recipe card, I remembered when I wrote in that style. It was in junior high! I'm not sure of the recipe source (maybe copied from a Hershey's ad in Seventeen magazine?) but I remember making these cookies and thinking they tasted like brownies. I copied the recipe down with my neatest handwriting and after all these years I still have it. So, when I was at the grocery store and found a package of limited edition NESTLÉ® TOLL HOUSE® Dark Chocolate & Mint Morsels leftover from the holiday season, I decided to pull out this old recipe and pair it with these chips. I had considered adding peppermint extract to the chocolate cookie dough to make sure I had enough mint flavor. But, when I opened the bag of chips, I could smell the mint and decided against using more mint flavor. I hoped the chips would be enough, and when I bit into my first cookie, I knew I had made the right decision. 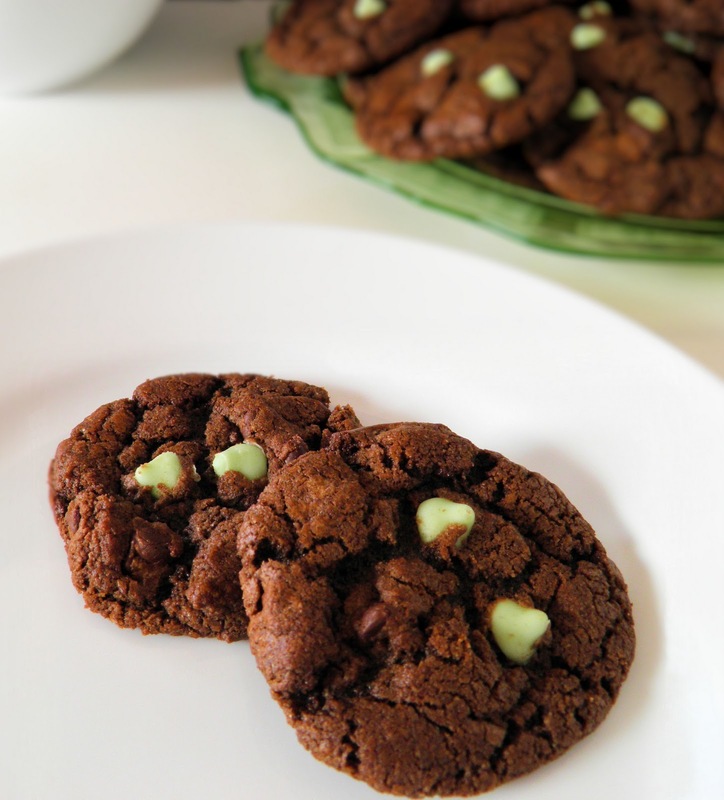 A chewy chocolate cookie with mint and dark chocolate chips. 1. Cream butter and sugar in large bowl; add eggs and vanilla and blend well.2. In a separate bowl combine flour, cocoa, baking soda, and salt.3. Blend dry ingredients into the creamed mixture; stir in chips.4. 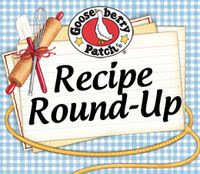 Drop by heaping teaspoonfuls onto ungreased cookie sheet.5. Bake at 350° for 8 to 10 minutes. (Do not overbake.)6. Cool on cookie sheet until set, about 1 minute.7. Remove to wire rack to cool completely. these look fabulous and so do the pictures! Dee-licious! Mint and chocolate is always a hit wth me. Wowowowo !! I want some !! These look so great! A favorite flavor combo for me! These cookies look delicious! I love chocolate and mint! these look so easy and delicious! Yum! These look so good! Just can't miss with chocolate and mint. I agree with Tiffany these will be great on St. Patrick's Day. dark chocolate and mint were flavors that were meant to go together. These cookies look great. I know you just awarded me the 'Stylish Blog' Award but I wanted to give you the 'One Lovely Blog Award' as I really enjoy reading your blog and seeing your beautiful pics! All I can say WOW!!! I am making these tomorrow! You Rock! New follower here...These look so delicious!! definitely going to try these for St Patty's day!! Thank you so much for stopping by Heavenly Bites Cakes - and for following too!! OO, these look SO good. these look super! chocolate and mint is one of my fav combos! what a great find! These look irresistible! I love the mint and chocolate combo! 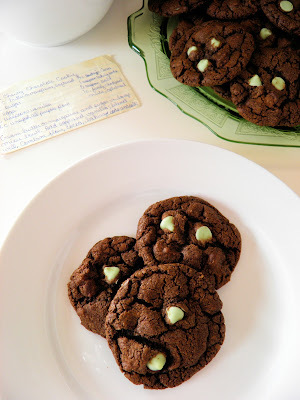 I love the combo of chocolate and mint! Your cookies look delicious! Those little green mint chips are the perfect touch! Of course, this looks delicious. But more importantly, I wanted to thank you for your kind words and thoughts. During this dark time, this blogging community means more than I can easily express. Thank you. Hold onto those you love this week. Still running around with the blog hop. These look soooo good.